Porcelain inlays and onlays provide cosmetic restorations for back teeth that have suffered serious decay or damage. Both provide extra strength and are custom fit to your teeth by your cosmetic dentist in Aurora, allowing greater comfort and a more natural appearance. Sometimes patients present with a tooth in need of repair. 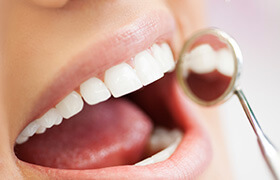 The damage, however, may be too great for just a tooth-colored filling, but not extensive enough to warrant a dental crown. In this case, Dr. Mauck and Dr. Ricci will recommend either an inlay or an onlay. Inlays fit within the confines of the cusps of a tooth, while an onlay covers one or more cusps and may even extend over the edge of a tooth. Inlays essentially replace fillings as an option for smaller cavities, and onlays are used when damage is more extensive. The beauty of porcelain inlays and onlays is that they offer a cosmetic option for fixing dental damage, but they don't sacrifice strength. 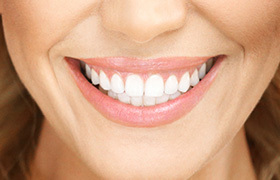 They reinforce and stabilize your natural tooth for a conservative fix while blending in and giving you a natural look. Suffering from decay and cavities? Ask us about porcelain inlays and onlays as an option for reversing the damage and providing ongoing protection. Normally, inlays and onlays are both manufactured off-site in a dental lab. In this case, your Aurora dentist prepares the tooth and takes a molded impression that the lab uses to fabricate the restoration. While this happens, we place a temporary inlay or onlay on the tooth. When the permanent restoration is ready, you’ll return to our office for the final step when the inlay or onlay is cemented into place.